What if you change your conflict behavior but those around you don’t really notice – and worse, don’t give you the credit you deserve for your habit-changing efforts? A few months ago, a conflict coaching client raised this very question. Elaine was working to become less reactive in conflict with her husband. She felt she’d made real strides: Much less of her biting New York sarcasm to stew the conflict pot, better ability to state clearly about what she needed as part of a solution instead of getting angry her husband couldn’t just guess what she needed, better at taking a break when she felt herself approaching her boiling point, and regularly choosing better timing for when she raised difficult matters for discussion and negotiation. Well, yes, he is. Blindered. Reason 1: He’s caught in a reflexive loop. Marriages are a system – a family system. In systems thinking, reflexive loops are caused when we select partial data from our observations, draw conclusions as a result of the selected data, and use those conclusions to generate a belief about the person or situation. 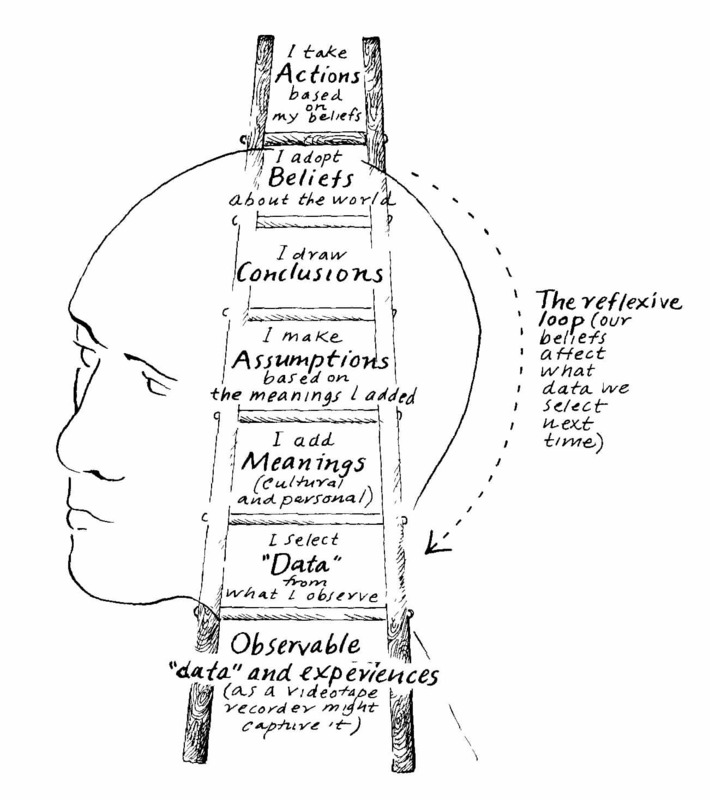 Our beliefs then affect what data we select next time, and the loop continues. (Click here to see a reflexive loop drawing by Martie Holmes). From all their years together, the husband has a belief that Elaine is biting, sarcastic and aggressive during even minor disagreements. Today, when he and Elaine disagree, he subconciously notices primarily the moments when she says something that fits his belief. He doesn’t notice all the times she doesn’t — just the slip-ups while she’s still polishing her new habit. When he notices her slip-ups, those register in his mind as confirmation she’s still doing the things he finds so unacceptable. So he concludes she’s still biting, sarcastic and aggressive during conflict. Then he returns to step 2 and repeats, each time ingraining his mental model of her yet more deeply. His beliefs about her blinder him to the fuller picture of her response to conflict. Reason 2: It’s harder to see what someone doesn’t do than what they do. In part due to reflexive loops and the ingrained mental models they produce, her husband is failing to notice what she isn’t doing – he can only notice what she is doing (and even then, is only allowing himself to see those things that confirm his belief). He doesn’t notice when she bites her tongue instead of lashing out because it’s hard to hear what wasn’t said. He doesn’t notice when she skips a sarcastic remark because he can’t hear what she doesn’t say. Elaine needs to challenge her husband’s reflexive loop with alternate data. And she needs to find a way for him to notice what she isn’t doing during conflict conversations. And she needs him to acknowledge her successes when he’s finally able to see them. I gave her several strategies I’ve developed for accomplishing those three things and am betting they’ll have the impact needed.